Samasource is a nonprofit organization that connects people living in poverty to life-changing digital work. Since 2008, we've paid out over $2 million to more than 4,000 workers from disadvantaged regions in countries like Kenya, Uganda, Ghana, India, Pakistan, and Haiti. These workers support an average of 3.6 dependents, which means that our programs have directly impacted over 17,500 people. organization that gives financial assistance or basic necessities to the poor, we employ people from the bottom of the pyramid and train them to work on digital projects for huge global brands. 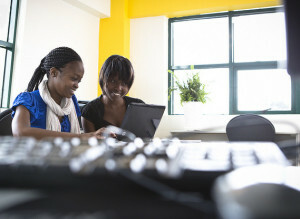 Through our programs, women from the slums surrounding Nairobi have completed computer-based tasks for companies like Microsoft, LinkedIn, Getty Images and more. Why give work? The opportunities we provide to the under-resourced are transformative. Here are five reasons to give work rather than aid. We hope that these bullets provide a snapshot of the global need for good jobs and why Samasource strives to fulfill it. According to the International Labour Organization's most recent surveys, 202 million people around the globe were unemployed in 2013. Set alongside the staggering number of people living in poverty today--estimated by the World Bank to be nearly 1.4 billion--this metric communicates the intense need for jobs that pay living wages worldwide. In sub-Saharan Africa alone, over half the population lives on less than $1.25 a day. Suicides in countries such as Uganda have occurred due to frustration over a lack of employment opportunities. We specifically target women and youth without formal work experience due to how underrepresented these groups are in the global economy. In Africa especially, youth unemployment, underemployment, and poverty rates have skyrocketed--the African Economic Outlook reported in 2013 that more than 70% of Africa's youth were living on less than US $2 per day. The lack of gainful employment opportunities for women is, meanwhile, an equally pressing and worldwide issue. The International Labour Organization reports that nearly 200 million women workers were unemployed around the globe in 2012. The United Nations further estimates that over half of the world's female workforce is currently in vulnerable employment, holding menial, low-paying jobs without social protection. While these numbers are dismal, they also represent a colossal opportunity to promote social growth; supporting women has consistently proven to instigate major socio-economic gains in impoverished regions. The UN has observed, for instance, that in the rural areas of developing nations, women control supplies of water, food, and fuel. They are also more likely than men to invest in their children's health and education. Giving a woman a good job not only supports her; it also supports the members of the next generation that are in her care. Thanks to studies conducted by our impact team, we've discovered that employment through Samasource allows workers to develop in-demand skills and increase their earning power. But we don't just train our workers to complete computer-based tasks. We also provide them with soft skills and language skills that help them foster better relationships with employers. We're proud that 93% of our workers claim significant positive gains in not only technical skills but also English speaking skills after 5 months with us. Better familiarity with the English language helps these workers to secure ongoing employment in the competitive job markets of their respective regions. Samasource Worker Denis in Awach, Uganda, with his family. Samasource also proves, through the jobs it provides, that people in poverty can meaningfully contribute to the global economy. Despite their lack of resources, some of our workers have academic backgrounds in computer science and ICT; for over 66%, however, computer-based work is an entirely new activity. By training these individuals to participate in digital projects for leading brands, we expose them to new worlds of possibility. 56% of our workers go on to pursue bachelor's, associate, or graduate degrees with money earned at Samasource. The majority study ICT or business; the exposure we provide to the global technology industry compels them to continue learning about it. In brief, giving not just work to the impoverished but formal, computer-based work shows them what skills they need to compete in today's economy. Samasource doesn't just provide its workers with a paycheck; our programs offer a foundation of skills and experience upon which a career can be built. Through our impact measurement system, we've seen that 89% of our workers have successful outcomes, either moving on to better work opportunities or returning to school to study business and improve their ICT knowledge even further. Of those who find post-Samasource work, 95% are hired in the formal sector. Since almost all of our workers come to us with less than six months of formal employment experience, we consider this a central indicator of the deep and positive impact we have on their lives. While Samasource is a long way off from solving the problem of poverty for good, we're pleased to have impacted as many people as we have--not only our workers, but their dependents, and their communities. Building up the skill sets of the disadvantaged, and as a result building up the local economies of disadvantaged areas, may eradicate the need for aid in those places once and for all.